By comparison, only 39% own an iPod Touch, iPhone or iPad. It seems like everyone has an iPhone these days, but the reality is that more homes boast a current-gen game system than Apple's incredibly popular phones. 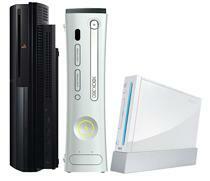 Current gen, of course, means a PlayStation 3, Xbox 360 or Wii. The National Polling Data Group (NPD) says that you'll find one of these consoles in 56% of homes, which means that a majority of US homes have at least one gamer in them. That number doesn't count dedicated gaming PCs, which means the total should go even higher. No wonder those anti-game laws get shut down so quickly. Over the last year, time spent gaming has also increased. On average, gamers have added 7% to their gaming time. That number is hugely significant for the two HD consoles, considering that Wii play time was down 22% over the last year.